Unfortunately, as I write, the rain is tap-dancing on the roof. 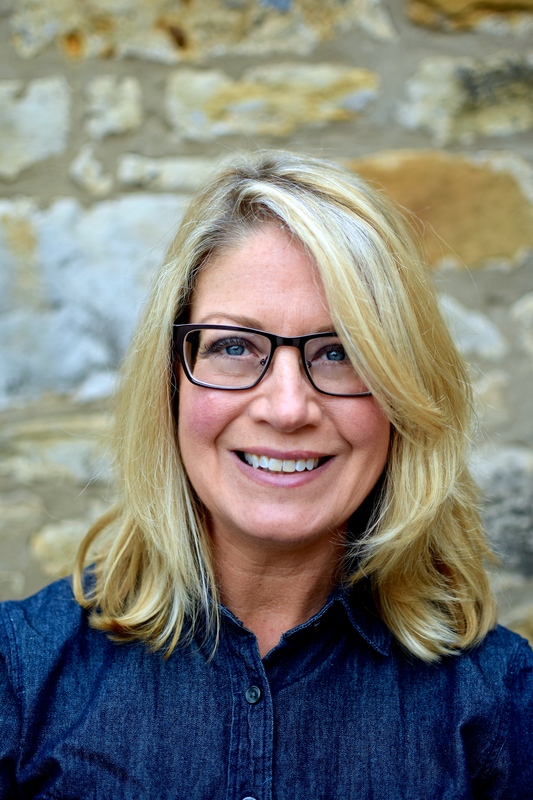 But luckily for me – and you too – this is an adaptable recipe, as delicious warm overtop hot pasta and with a side of stir-fried chard, as it is cool and smoodged onto fire-grilled ciabatta slices, a la bruschetta. 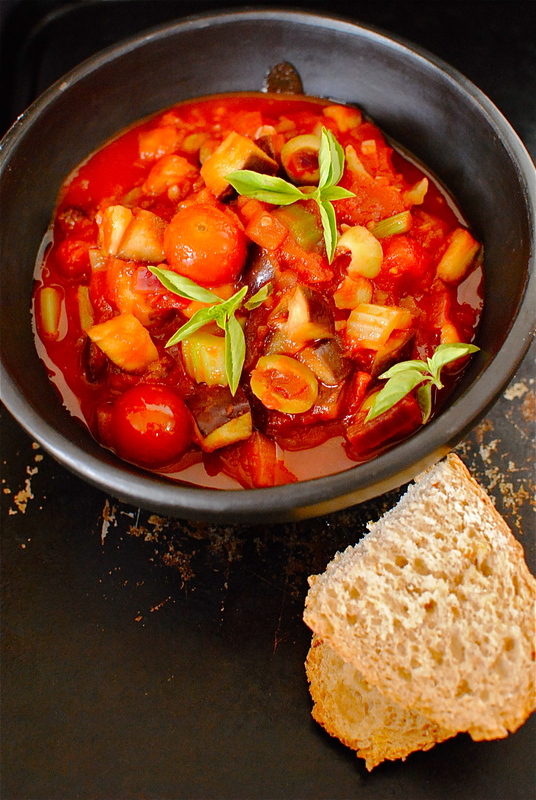 I am kind of halfway-house today with a heaped serving spoon (well ladle really – remember, I’m greedy) of caponata nestled up against some fresh bread, the sweet and sour juices soaking up nicely. What you don’t see is the the chunk of aged Parmesan I have been gnawing on for a protein fix. 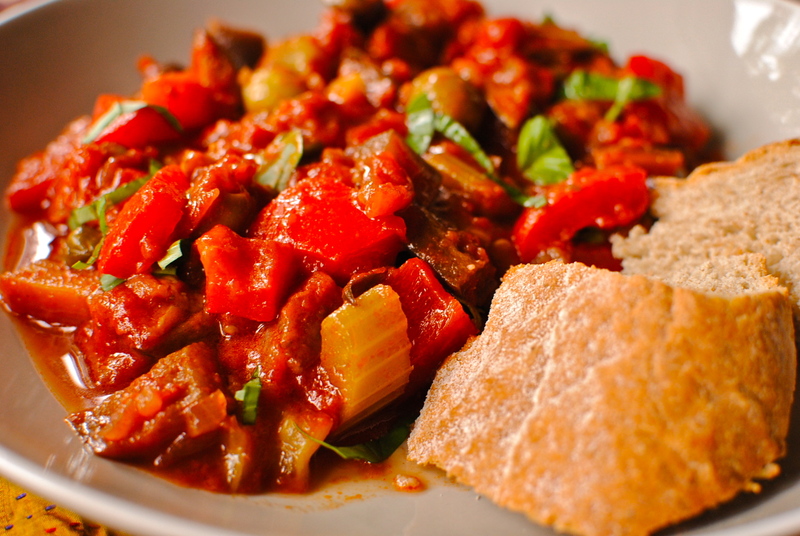 Caponata is so adaptable that it can be used in almost countless ways: as a tart filling, as the base of an Italian-style fish and seafood stew, over soft steaming polenta, in little puff pastry cups for a retro appetiser, in lasagne, melanzane parmigiana, as a side to simple roast chicken or grilled fish, on pizza or pitta, and stirred into cooked grains along with lentils for a fabulous brown bag lunch. And, I haven’t tried this, but I imagine it would be the delicious basil-spiked centre for gorgeously dinky arancini. Miss R loves arancini so I might just have to save some for this very purpose. UPDATE: It’s made its way onto PIZZA! As for the caponata, I have cooked it in stages to keep the celery with some bite and for the capers to still pop in the mouth rather than wilt into the final dish. But do add it all in at once if you like, the taste will always be terrific. How can it not be with such amazing summer ingredients? 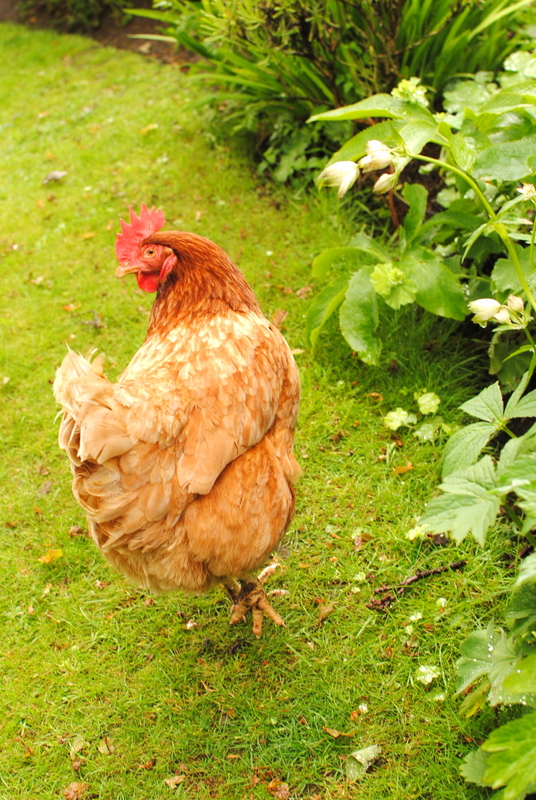 What is your favourite adaptable go-to summer recipe? 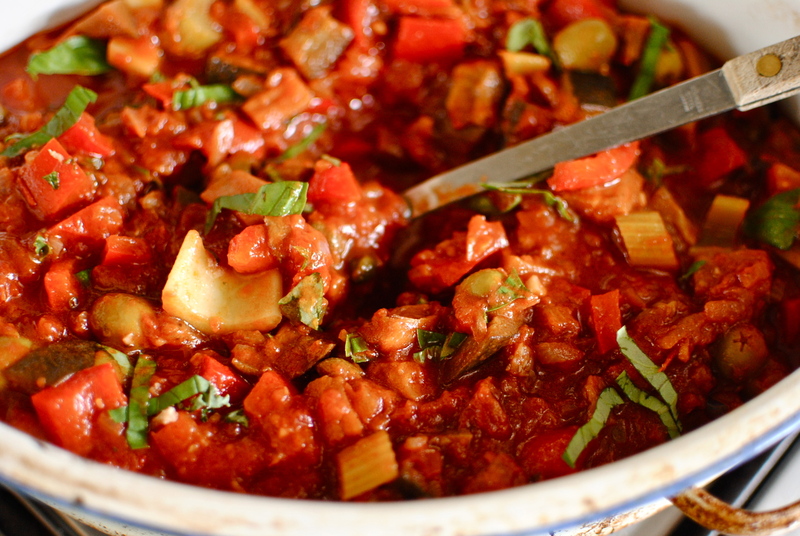 This Sicilian-Arabic compote of vegetables is traditionally served as a starter, but I think it is much more versatile than that: on bruschetta (grilled Italian bread slices, to you and me), on griddled polenta cakes, with pasta, in a jacket potato, as a side with plainly grilled chicken or fish. I’m sure you can think of other uses for this wonderfully sweet sour dish. During the summer months, when aubergines and tomatoes are at their sunny, gorgeous-hued best, we have this once a week in a variety of permutations, sometimes adding in a tin or two of butter beans for protein. If at all possible allow this melange to ‘develop’ overnight. This really is worth the effort and attention. 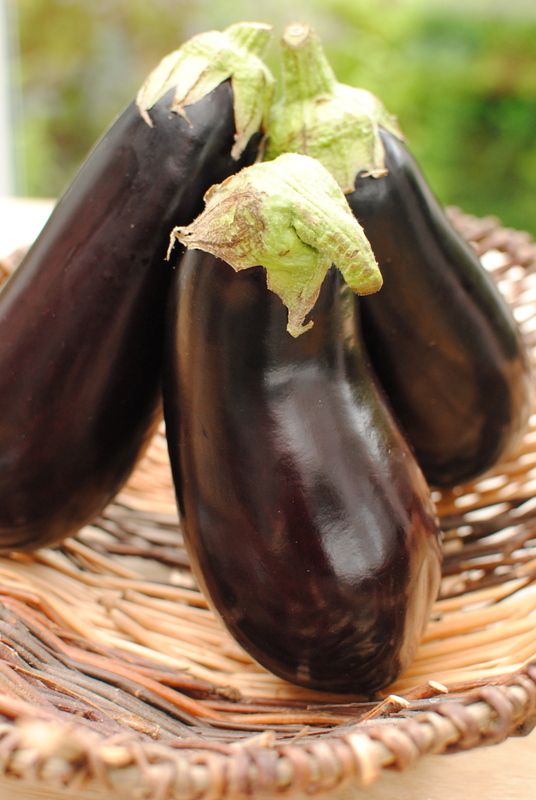 Cut the aubergines/eggplants into chunks about one inch or two centimetres square. (You may prefer slightly larger or smaller pieces.) Do not peel. Cook these by steaming covered in a large pot until completely cooked but firm. (Don’t boil them.) Drain well and set aside. OR, sometimes I chop them into cubes and toss them in a little olive oil and roast them for 15 minutes at 200C/400F. Need more calories? Add two extra tablespoons of extra virgin olive oil when you add the vinegar and sugar OR drizzle the served the portion with extra virgin olive oil and top with a sprinkle of crumbled feta or goats’ cheese. N. B. This is a fairly salty dish because of the olives and capers so perhaps don’t add salt to whatever you are having with it – be kind to your kidneys! where’s that woman with my food! Thanks darling! How are things with you? Hopefully not too cold & wintry?! This sounds absolutely delicious and caters perfectly to the current eggplant cravings I’ve been having! I can’t wait to try it as soon as eggplants hit my local farmer’s market. Thanks Alice. Eggplant is the star here and I would be honoured if you were to start off the season with this recipe. Well now you’ve got my attention! My 94 year-old mother-in-law taught me how to make capanata – their family calls it capanatina. We love it! By the way, I make THE BEST arancini – taught to me by my mother-in-law! Well, I am going to be experimenting with a baked – as opposed to the normal fried – arancini this week. I hope it might tempt you Urvashi. Really liked your foraging post! That would be great. Am not a fan of frying things at home which has put me off experimenting. Sadia at Baking elements had a recipe for baked falafel recently which I keep meaning to try out. Well, I hope your mother-in-law wouldn’t be too shocked with my upcoming (once I perfect it!) baked arancini recipe! I bet she has a wealth of fabulous recipes and food stories in those 94 years. Is yours a traditional recipe? what kind of filling do you have? Our recipe is pretty traditional. I had arancini in Florence, Italy and mine was similar to theirs – he had more egginess in the rice, whereas I make it with more tomatoe sauce in the rice. The filling has meatballs, sausage, peas and mozzerella. I can email you the recipe if you’d like. Let me know. That sounds great Linda, I would like that. I’m interested to know how you cram all of those goodies in! I will email you, okay? Creamy polenta with herbs in is my favourite if I’m not being lazy with the bread option. I do love a good caponata. I think my favourite go to summer recipe is hummus. You can make it with so many different things – sweet potato like on the blog but also butterbeans work so well. It’s just proper summer comfort food. I’m afraid the San Diego sunshine is slow in getting here although Saturday waterskiing was sunny & warm. 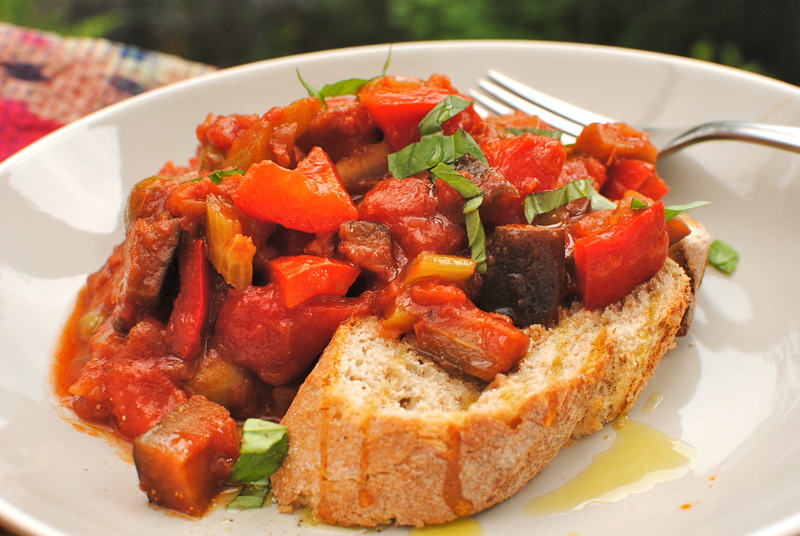 Do make the caponata, you won’t regret it. Doing own Spicy RD thing with the basic recipe, of course. PS saw you had a song link! 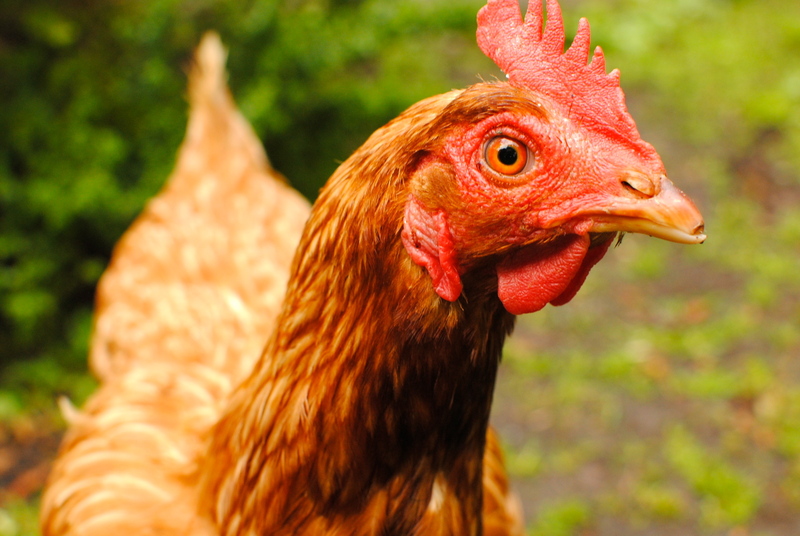 Love the chickens and this recipe. I’ve never had caponata. I’ve added this to my list of must make recipe on Pinterest. It looks amazing! Thanks Kristi. I would be so pleased if you did. And thanks for Pinteresting it. I’ve been v slack on pinning. I must follow you! Oh so summery!!! Was just wondering how to make my packed lunches more interesting and a box of this with a big old hunk of bread seems very very appealing! I hope that works for you – it’s extremely versatile – add beans, lentils, feta or pecorino cheese for protein and it will be a proper lunch. The caponata looks delish! I made caponata one time and put some on a baguette with melted mozzarella and ate it as a sandwich. I enjoy reading your blog. I will have a look at the site. Thanks for including me. Very kind of you! 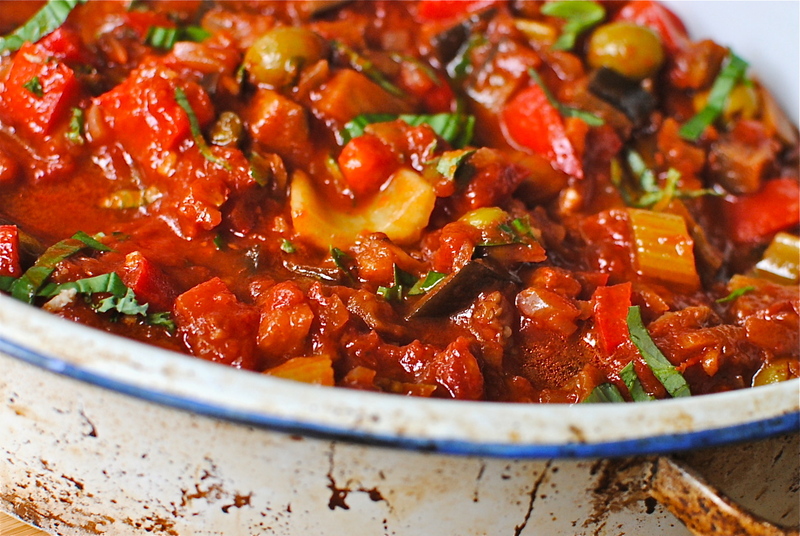 Love the idea of sticking some feta or goats cheese with this Caponata. All it needs now is some sunshine! Well hopefully today is the day! Gorgeous sunshine in Edinburgh & Glasgow so hopefully the same where you are great day for caponata with goats’ cheese. I’ve been looking for a recipe like this all my life! Have you ever been to Strada and had their bruschetta starter? It’s so delicious; I can’t quite put my finger on it but I think it’s like caramelised red onious with roasted red pepper and tomatoes or something else. All I know is this looks pretty similar to it so I think I’ve found my love at last. Thank you!